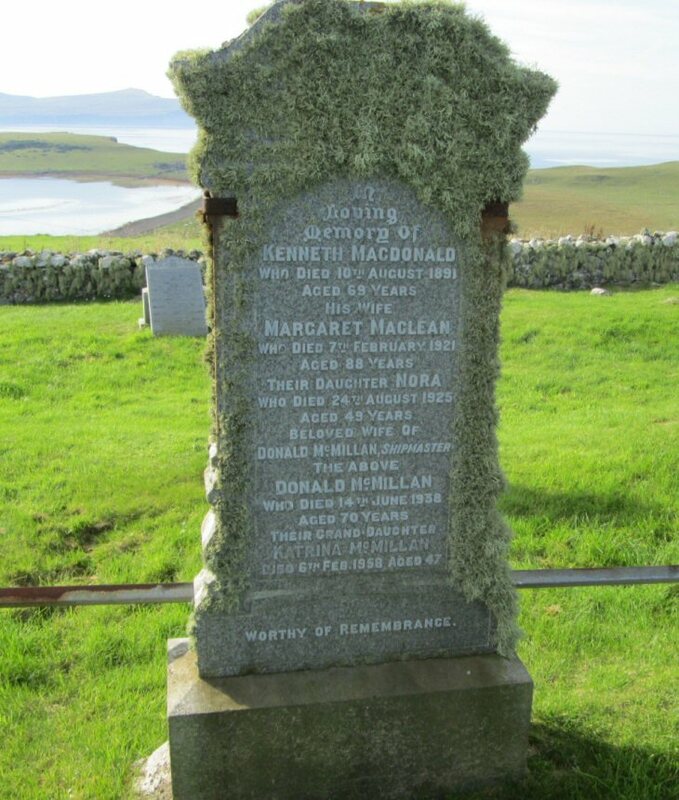 Skye Gravestones | Kenneth & Margaret (Maclean) Macdonald & family. Kenneth & Margaret (Maclean) Macdonald & family. In/loving/memory of/KENNETH MACDONALD/who died 10th August 1891/aged 69 years/his wife/MARGARET MACLEAN/who died 7th February 1921/aged 88 years/their daughter/NORA/who died 24th August 1925/aged 49 years/beloved wife of/DONALD McMILLAN, shipmaster/the above/DONALD McMILLAN/who died 14th June 1938/aged 70 years/their grand-daughter/KATRINA McMILLAN/died 6th Feb. 1958 aged 47.